Check out the on road test ride experience, photos, features and details of all New 2017 TVS Wego scooter below. The latest 2017 TVS Wego is powered by BS4 compliant engine and AHO. This is the third 110cc scooter which we are reviewing from TVS Motor Company after the TVS Jupiter and TVS Zest 110. TVS has a wide range of scooters in the 110cc category in the Scooty and Jupiter series. Today we will be testing the TVS’s Wego series. We picked the Dual-tone Orange-Black variant of TVS Wego from Hemant TVS, a very large TVS dealership located near Yelahanka of Bangalore. What follows below is our detailed review of TVS scooter. The all new 2017 TVS Wego gets a simple yet appealing design. TVS Wego gets a metallic body and is powered by bright Always-On-Headlamp . The front dashboard is fully digital and offers advanced functionalities when compared to old version of Wego. The Digital speedometer hosts functionalities like trip-meter, odometer, digital clock, low battery indicator, service indicator and comes with reader-friendly blue-lit display. The Wego features alloy wheels, convenient E-Z centre stand and external fuel filler cap. The all new TVS Wego gets 10 different color variants. 6 of them are monotone colors and 3 of them are dual-tone color variants. Only very recently TVS Wego was launched in attractive metallic orange and T-Grey color variant. You may check all colors of TVS Wego with photos here. The all new TVS Wego measures 1834mm in height, 640mm in width and 1115mm in height. The wheelbase of TVS Wego measures 1275mm. The TVS Wego’s seat height is relatively short which is reachable even for short riders. The fuel tank capacity of TVS Wego is 5 litres. The underseat storage is sufficient enough to keep a camera bag or helmet. The all new 2017 TVS Wego is powered by 4-stroke, single cylinder, air-cooled, spark ignition 109.7cc engine. TVS Wego’s 110cc engine is capable enough to churn out a maximum power of 5.88kW at 7500 rpm and can deliver a peak torque of 8.4Nm @ 5500rpm. The engine is mated to a CVT automatic gearbox. Both Self-start and Kick-start options are available for TVS Wego. Talking about the on road performance of TVS Wego, the scooter felt easy and good to ride in city conditions in a small range. When taken on long range (for more than 20 Kms) on highways, the Wego got bit tired (and even the rider) – the reason could be scooter’s light weight and we felt its not-so-stable when ridden more than 80Kmph. Scooters like Jupiter, Dio, Activa 125 and Access 125 performed well even at the higher speeds. The Mileage offered by TVS Wego scooter is not something which we can highlight. While it did provide good fuel-efficiency when ridden on “Eco” mode, but on “Power” mode the mileage was quite average. The “power” mode triggered whenever there was a higher rate of acceleration or at higher speeds and we got a mileage of around 35Kmpl to 40 Kmpl which is not that great for a 110cc automatic scooter. TVS Wego gets advanced telescopic suspension in the front and a unit swing, gas charged hydraulic damper suspension at the rear. We got a chance to test the TVS Wego in the rainy and wet conditions and scooter performed well offering a good stability on wet surface. The handling and manoeuvring ability offered by TVS Wego is good. Making those quick turns and zig-zagging through bumper-to-bumper traffic were achieved at ease. Special mention to TVS Wego’s unique “Body Balance Technology” which claims to offer better balance during the ride, enhanced stability and ideal body weight distribution. The features like Body Balance Technology will be particularly helpful for beginners who are trying to learn the scooter for the first time. They can take the advantages offered by this technology and quickly learn body balancing and the art of riding the scooter. Both the front and rear wheels gets 130mm drum brakes. 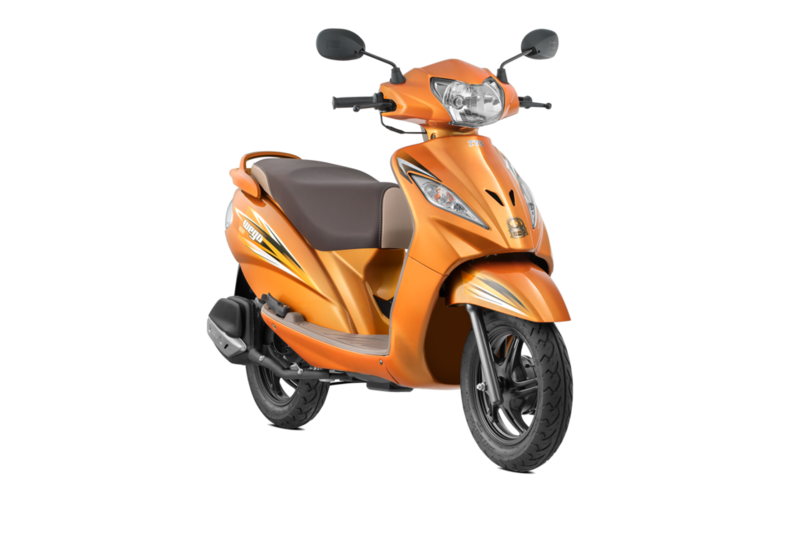 The scooter is also available with 220mm Disc brake in the front which is priced slightly more. The brakes were responsive – Thanks to TVS’s Synchronized brake system. The ride on TVS Wego with a pillion rider was good – the seats were good and the grab rails offered good support for the person sitting at the back. TVS Wego offered good amount of space in the front as well as under the seat to store shopping bags and helmet. We felt TVS Wego is a pretty looking, decent scooter for short distance travel. The body balance technology and synchronised braking system makes the Wego a great choice for beginners. The external Fuel filling ability, the all new digital only speedometer and the wide range of attractive colors offered makes TVS Wego a good scooter to buy. activa4g is using Hatena Blog. Would you like to try it too?